Autumn Amelia: Baylee Turns Six! 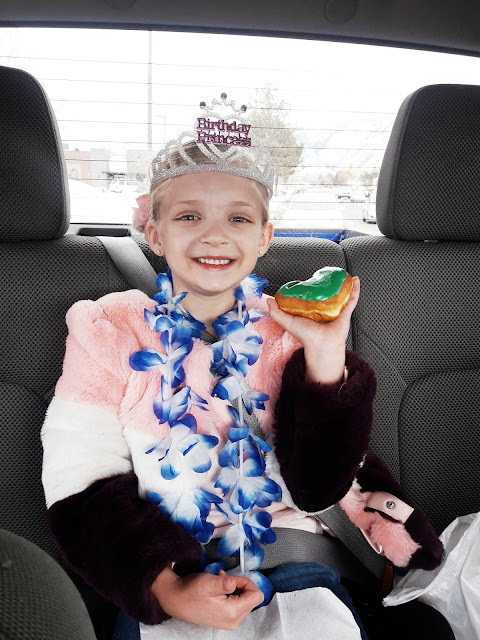 This past weekend my niece Baylee turned six. Erik and I took her out on a little day date to celebrate. We went to the mall and stopped by Claire's because that store is what little girls dreams are made of. After our visit, I think my niece would have to agree. So, we let her pick six items out by herself. She chose a make up palette, make up brushes, a set of 5 rings, sparkly nail polish, a set of 3 bangles and a birthday crown. Baylee saw a commercial for Olive Garden a few weeks ago and asked if we could go there. I thought it would be the perfect place for lunch after our shopping trip. When we arrived, she asked if she could get ready before going in. She put on her crown, bangles, rings, and some gold glitter eye shadow. It was so fun to watch her get all dressed up and take each item into consideration before putting it on. When we walked in all the servers wished her a Happy Birthday. She enjoyed playing games with Erik on her menu and ate all the breadsticks. Since it was her birthday celebration she received an ice cream sundae and was sang Happy Birthday. Afterwards, Erik realized that the Olive Garden shared a parking lot with Krispy Kreme. So, we made one more stop and got a donut each. Baylee chose a valentine themed one that was decorated like a conversation heart. She got the biggest kick out of the fact that it said "Call Me" on it. My nieces have such a special place in my heart. I love to hear about their interests and watch their imaginations grow. I can't wait to see all that they accomplish.